The eastern tent caterpillar, Malacosoma americanum, is a native species that occurs throughout the eastern United States and westward to the Rocky Mountains. Before the outbreak of the gypsy moth, the eastern tent caterpillar was considered by many authorities to be the most widespread and destructive defoliating pest of deciduous trees in the eastern United States. Its favorite host trees include apple, wild cherry, and crabapple. 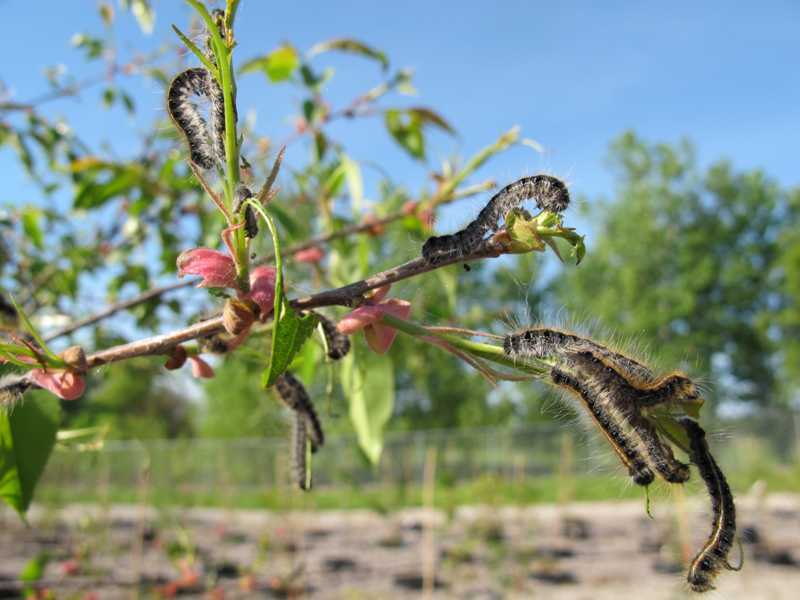 However, the caterpillars will also attack ash, birch, maple, oak, poplar, cherry, and plum. Populations fluctuate greatly because of factors such as unfavorable weather and natural enemies. 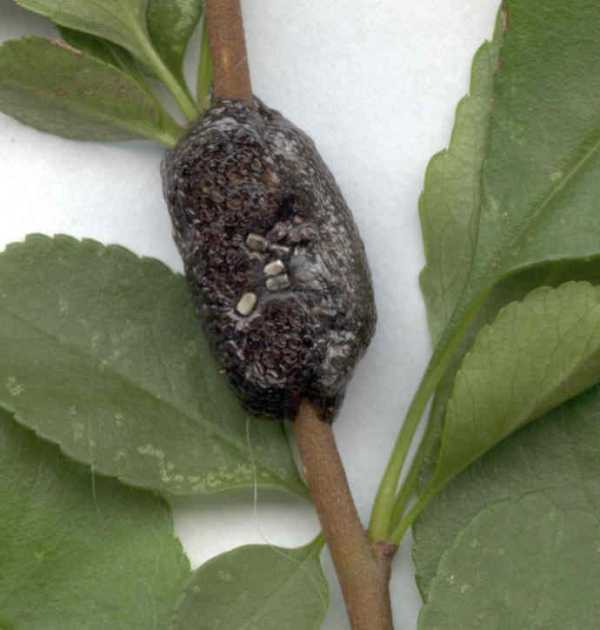 Eggs are laid in distinctive masses encircling the twigs of the host plant. The egg masses are about 3/4 of an inch long and are covered with a dark substance that makes them appear varnished. The egg mass has the consistency of styrofoam. Eggs hatch and the caterpillars gather at a nearby branch fork where they begin to build a silk webbed tent. As the caterpillars grow, they build new tents in the larger forks of trees. Webbed tents are the most obvious sign of the caterpillars. Another tent-forming caterpillar is the fall webworm, Hyphantria cunea. 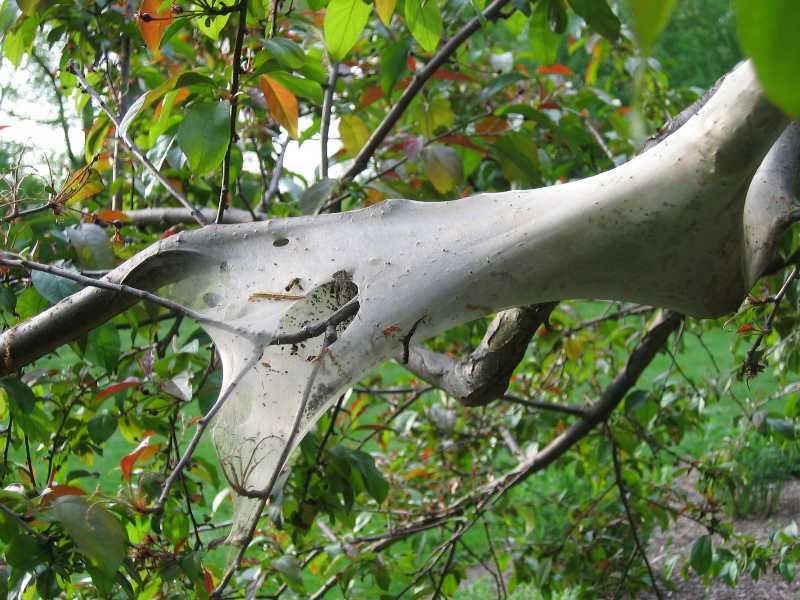 However, fall webworm caterpillars make webbed silk nests at the ends of branches and feed inside the nest. 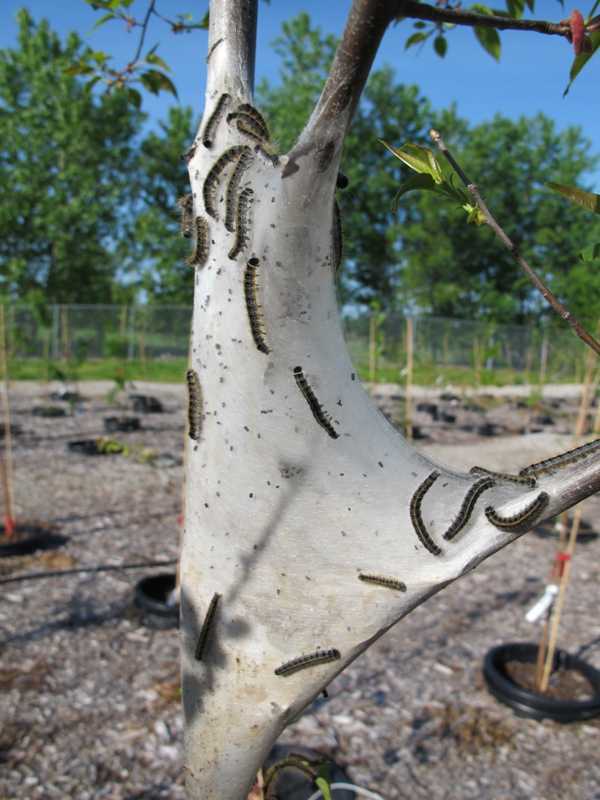 Eastern tent caterpillars have tents in a fork of a branch or tree trunk and they leave the nest to feed. 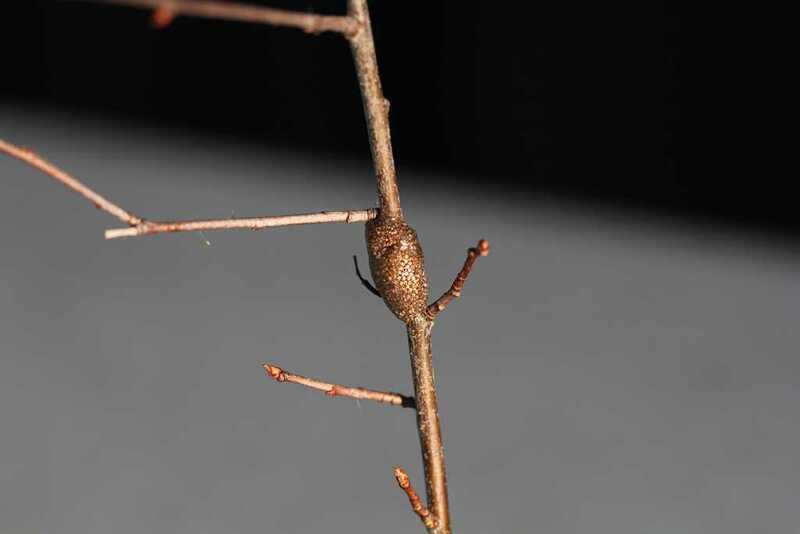 Tent caterpillars overwinter as eggs in an egg mass. 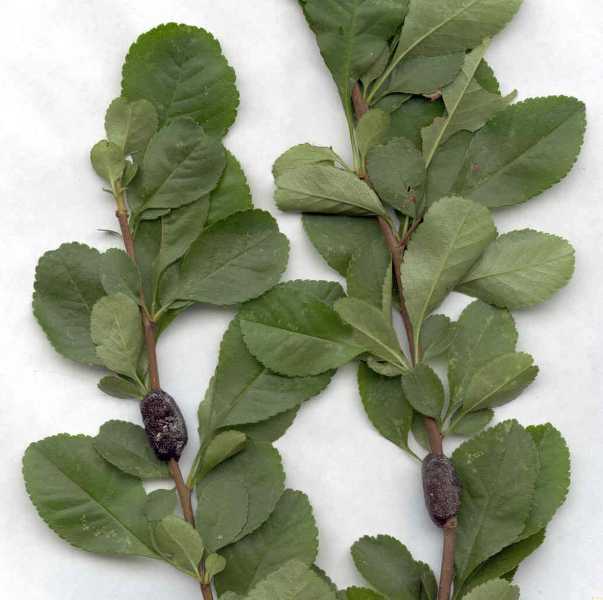 The eggs hatch in the spring, about the time wild cherry leaves begin to unfold. The young caterpillars quickly gather at a branch fork or crotch and begin to build a silk web. The larvae leave their tent to feed on foliage. Young caterpillars feed during the day and remain in the tent at night; older (and larger) caterpillars feed at night and remain in the tent during the day. Mature larvae can reach a length of about 2 inches. They are generally black with a white stripe down the back and have a series of blue spots between yellow lines that run lengthwise down the back. They also have long, fine hairs all over their body. This is the only common caterpillar with a white stripe down the back. At maturity, a caterpillar will leave the host tree and search for a place to spin a cocoon (fence post, tree trunks, debris on the ground, sides of buildings, etc.). Adult moths emerge in two weeks, mate, and lay eggs that overwinter. Moths have reddish-brown wings with two white diagonal stripes on each front wing. There is one generation per year with about 9 months spent in the egg stage. 1. Live with the problem. 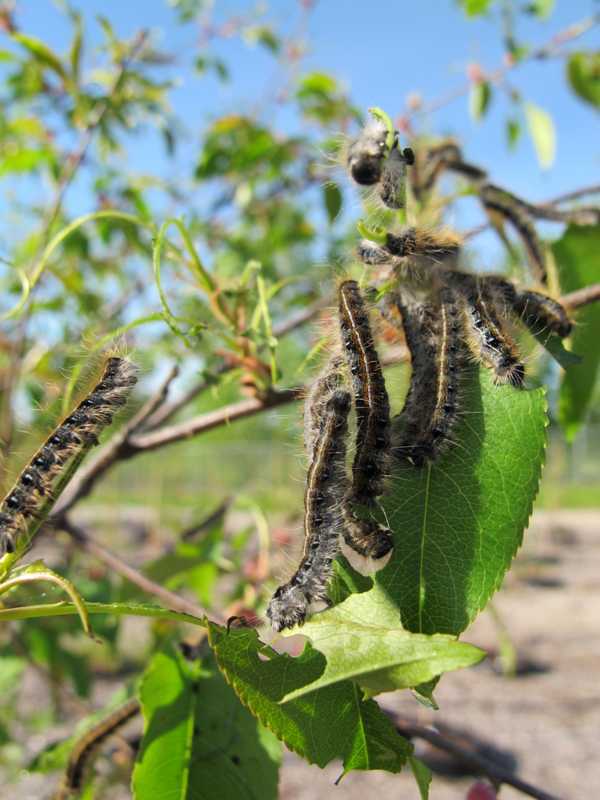 It is not necessary to spray insecticides to control the eastern tent caterpillar. 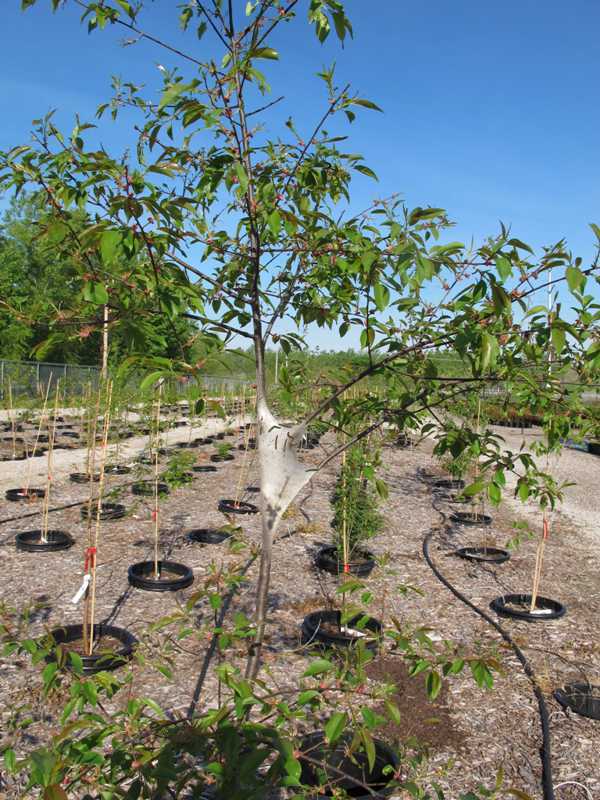 Healthy defoliated trees will grow new leaves. Infested trees can be unsightly and are less vigorous than attacked trees, but they are seldom killed. Typical natural controls include birds, predaceous and parasitic insects (especially wasps), and disease organisms. Caterpillars with white eggs or cocoons attached to their back should not be destroyed because they are being hosts for native parasites. 2. Handpick egg masses. 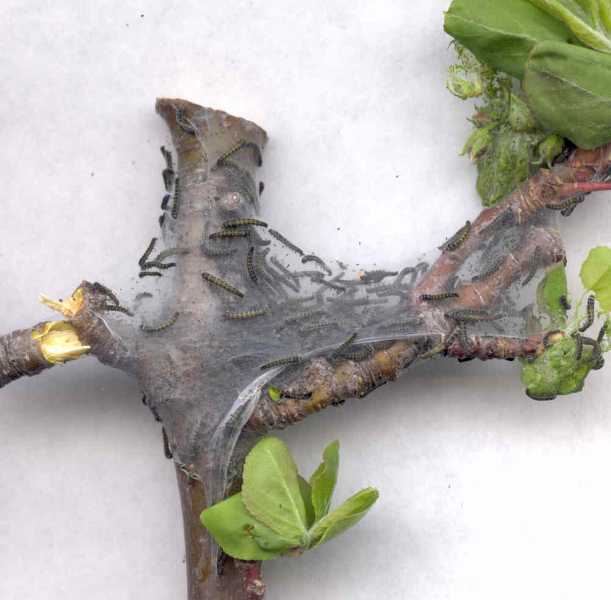 Future damage on small trees can be reduced by locating and removing egg masses during winter because they are most obvious at that time. They can be scraped off with a thumbnail or pruned out. 3. Manual removal of tents or caterpillars. Start looking for tents when service berries (Amelanchier laevis) or sugar maples (Acer saccharum) are blooming or when silver maples (Acer saccharinum) have leaves about 1 to 2 inches long. Tents can be pruned off if small, because they are usually located in small branch forks. They can also be removed by winding them around the end of a broomstick or pole that has a small brush or nails mounted on the end. It is most effective to do this at night or on cloudy, rainy days because the young caterpillars are gathered in the tent for protection and aren't venturing out to feed. Caterpillars can also be handpicked and dropped into soapy water. 4. Apply insecticides. If insecticide sprays are necessary, they should be applied when the tents are first noticed. Caterpillars leave the tents to feed so thorough coverage of the foliage with the insecticidal spray will provide control. Tents are water repellent so spraying them with water based insecticides is not very effective. Insecticides that can be used include Bacillus thuringiensis (Bt, Dipel or Thuricide), carbaryl (Sevin), pyrethrins, acephate (Orthene) or spinosad. Strategies 1, 2, and 3 are strictly organic approaches. For an organic approach to Strategy 4, consult the Organic Materials Review Institute (OMRI™) for appropriate Bacillus thuringiensis (Bt), pyrethrin and spinosad products.